Home » Destinations » Europe » UK » Scotland » The Perfect 5 Day North Coast 500 Itinerary: The Ultimate Scottish Road Trip! We’ve driven Scotland’s North Coast 500 road trip multiple times, in all seasons. We’ve taken trips lasting between five days and three weeks, and we’ve shared a number of planning guides, highlights, and itineraries on our blogs already. 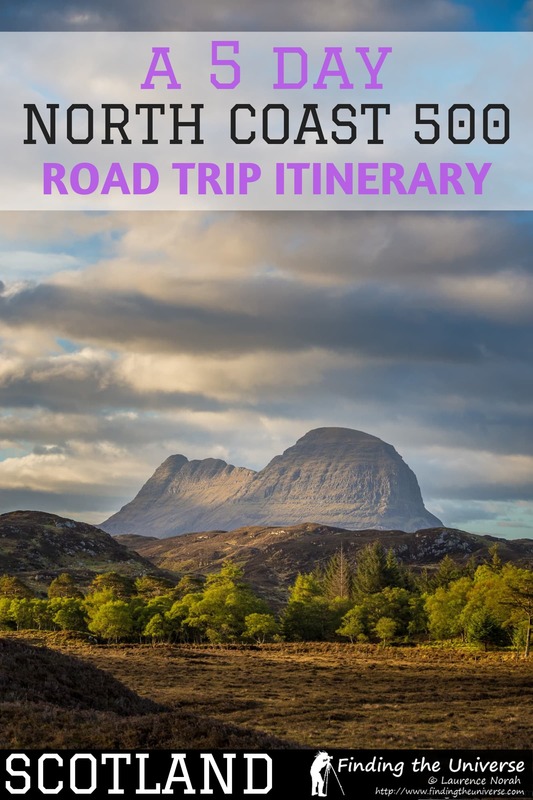 Today we’re going to share our idea of the ideal 5 Day North Coast 500 itinerary, to help you plan your own 5 day Scottish road trip! We would suggest that five days is a good amount of time in which to drive the North Coast 500. Five days will give you enough time for sightseeing and stops along the way, without feeling too rushed. You can of course drive the NC500 more quickly, completing the whole route in two or three days. We would advise against this though. There’s so much to see on the way, and the roads are not fast. As a minimum, we’d suggest at least four days to complete the route, and five to give yourself a more relaxed and enjoyable experience. Of course, you can take longer. We’ve taken multiple trips on the NC500, some over two weeks in length. There’s always more to see, back roads to explore, and far flung beaches to hike to! 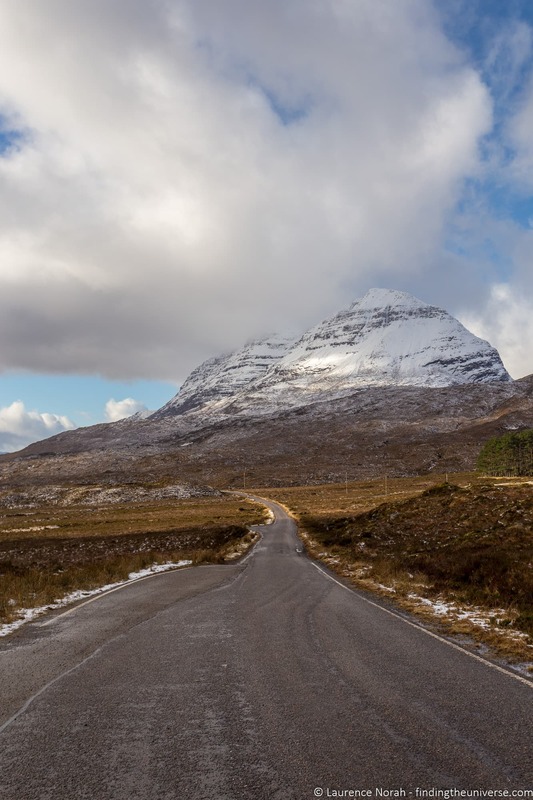 This itinerary assumes you’ll be driving the North Coast 500 in a car or motorbike, and staying in hotels or guesthouses along the way, and we have recommended some of our favourite accommodation options along the route for each night. The North Coast 500 is also a popular route to do as a camping trip, either with a motorhome or a more traditional tent. We have a 7 day North Coast 500 camping itinerary which includes many campsite recommendations. If you wanted to condense that down to five days, we’d suggest using this post for the itinerary, and that guide for ideas on where to stay. Now, lets get started with this detailed 5 day North Coast 500 itinerary. 5 days on the North Coast 500 will give you a good amount of time to see many of the sights along the way. However, as the going is slower in some parts than others, we’ve tried to balance this itinerary so you get fairly similar amounts of driving time each day. 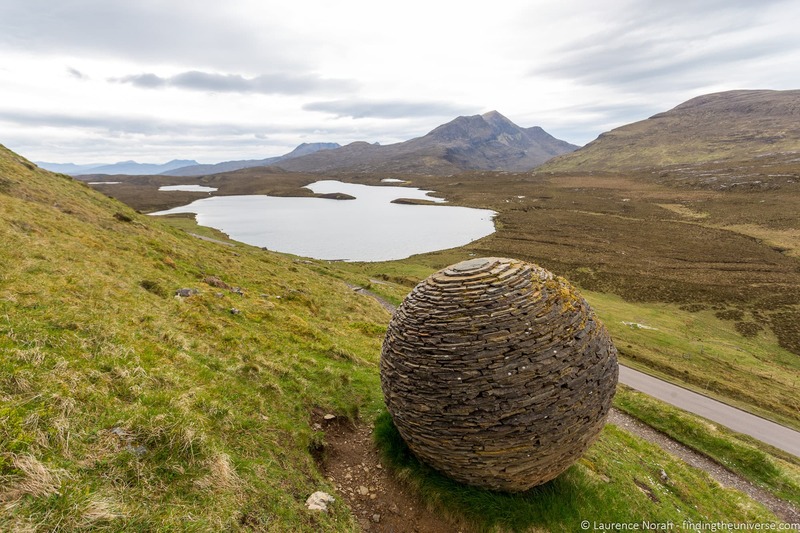 The slower parts of the route, largely due to winding single track roads, are to be found in the north west section around Durness, and the south west section around Torridon. So whilst the distances on some of these days might be less than other days, the slow going nature of the roads means they’ll take longer. Any detours you take, especially those on the west coast such as to the beautiful beaches of Achmelvich or Achiltibuie will also add time as these are slow roads. 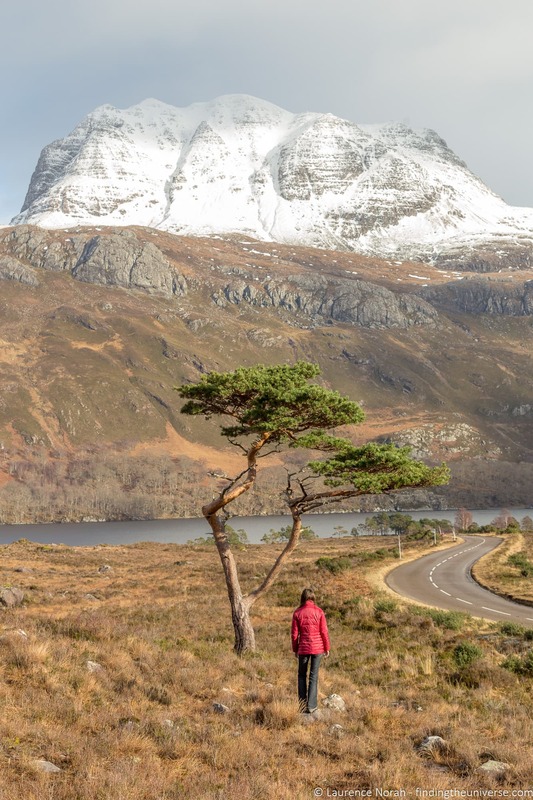 We’d recommend reading this post in parallel with our North Coast 500 planning guide, to get all the information you need for your adventure. The North Coast 500 starts and finishes in Inverness, so that is where our itinerary also starts and finishes. This is a very logical place for your adventure to begin, as it is well served by an airport and a fast train line, which links to the the rest of Scotland and also England. You can even get an overnight sleeper train from London to Inverness. Inverness is also fairly easy to reach by car, with a good road running between Edinburgh and Inverness, with a driving time of just over three hours. Inverness makes for a great base for exploring nearby attractions, including Loch Ness. 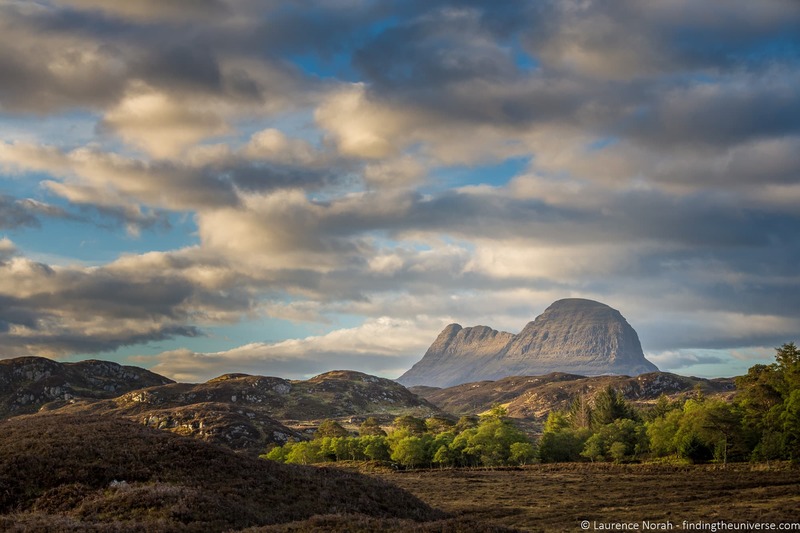 If you have time, we can recommend spending a day or two here at the start or end of your NC500 road trip, and taking some day trips from Inverness. Once you have yourself sorted out, and have your vehicle ready with road trip supplies (Inverness is a good place for both filling up on fuel and picking up road trip snacks! ), it’s time to head north as we have a lot to see and do today. The first area to explore is the Black Isle. This is a peninsula of land just north of Inverness which is home to its own brewery, a ruined cathedral and even some beautiful waterfalls. The Black Isle is also one of the best places in the UK to watch dolphins from the shore, which you can do at Chanonry Point if the tides are right. 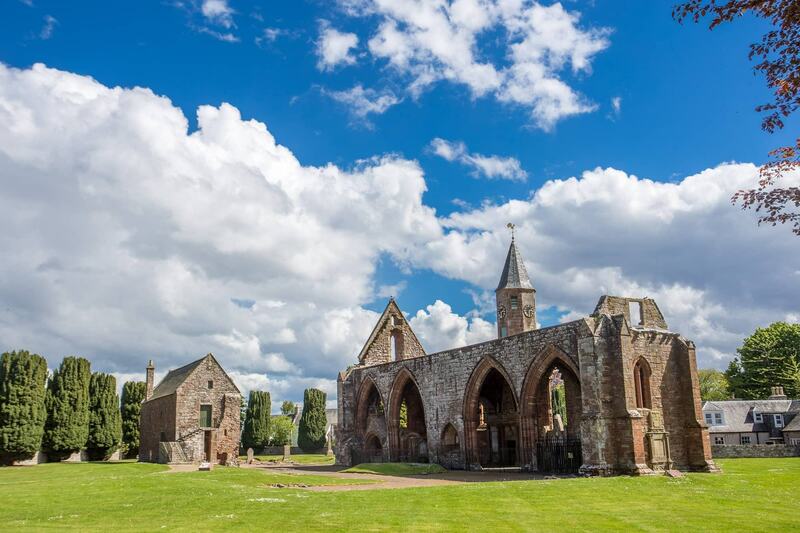 For more ideas on the Black Isle, see our complete guide to things to do on the Black Isle. Continuing north from the Black Isle, a short detour off the A9 road will bring you to Dornoch. This is home to a lovely cathedral, as well of one of Scotland’s most well known golf courses, the Royal Dornoch. There’s also a stone in Dornoch which marks the spot where the last witch was burnt in Scotland, in 1727. 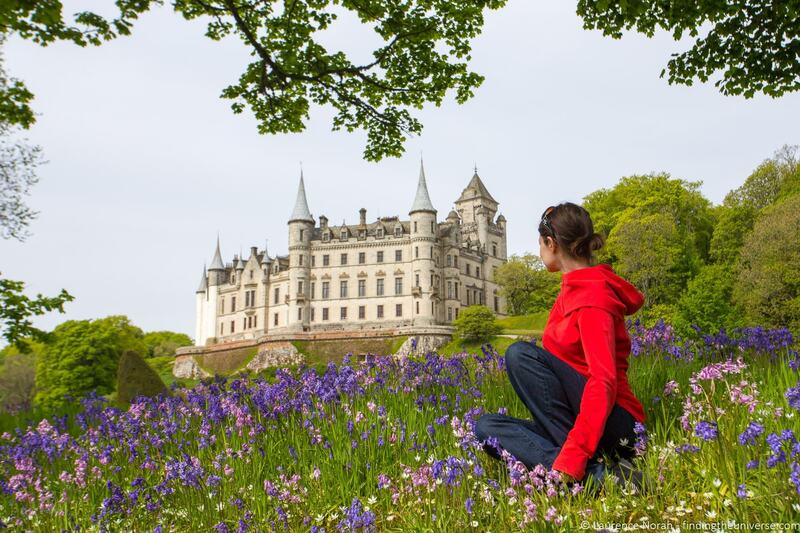 From Dornoch it’s another 20 minutes drive north to one of the highlights of the day, the spectacular Dunrobin Castle. This is a beautiful castle that looks like it has fallen straight out of a fairy tale, and we highly encourage you to stop and spend some time visiting. As well as a guided tour of the castle, you can explore the grounds, watch the falconry displays (see the falconry displays section of the website to see when they are on) and visit the Victorian era museum. A short drive north of Dunrobin Castle is Carn Liath, or the Grey Cairn. There’s a small parking area just before the Cairn (here on Google Maps), and it’s a 2 minute walk from here to the Cairn via a footpath. 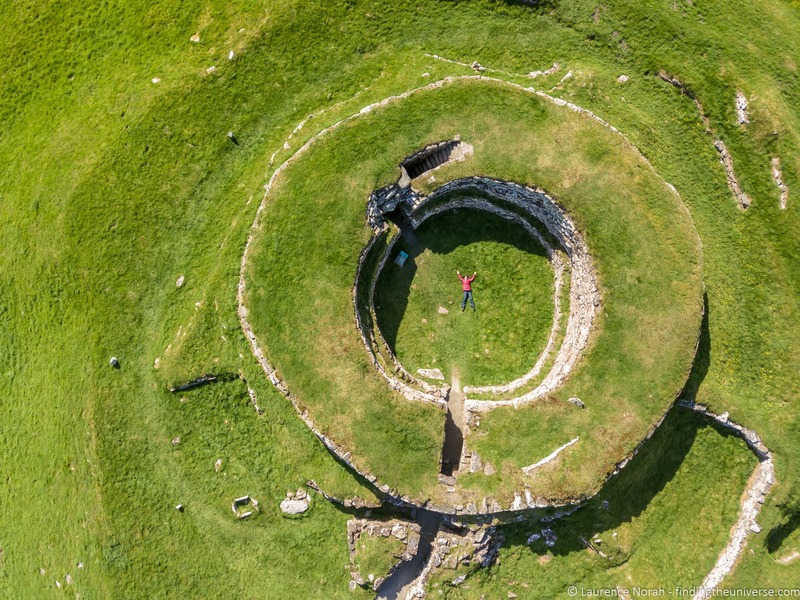 Carn Liath is a broch – an iron age structure that is around 2,000 years old. There are many of these all around Scotland, and this is one of the better preserved and more easily accessible brochs along the North Coast 500, which we think makes it worth stopping at. From Carn Liath you are on the final hour of driving to your destination for the first night, the town of Wick. You’ll pass through the pretty fishing village of Helmsdale, home to the excellent Timespan Museum. If you have time, it makes a good stop for learning about the history of the area, including the people, landscape and traditional trades. 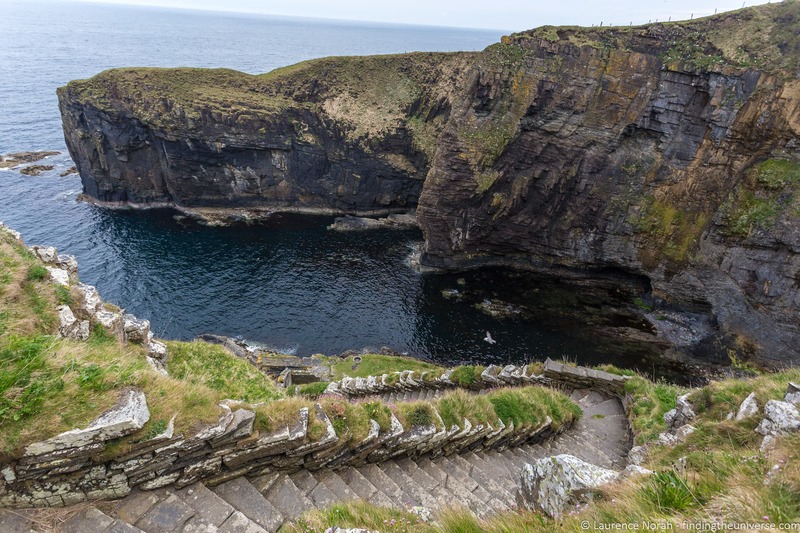 The last location you’ll pass on the first day of our itinerary is the Whaligoe steps, a series of steps carved out of the cliff face here which lead down to the sheltered Whaligoe Bay. This was once a popular harbour for local fishermen due to its natural protection, but when artificial harbours were built nearby, it fell into disuse. No doubt the women who had to cart the baskets of fish up these steps weren’t too sad about that! Finally you’re going to arrive at the town of Wick. This has a few attractions that we suggest you cover on your next day. For now, it’s time to head for dinner and a good night’s sleep. Day 1 Accommodation: Overnight at (or near) Wick. We recommend Thrumster House if you’re looking for a B&B. If you’re looking for somewhere in Wick, we recommend Mackays Hotel, which also serves lovely meals. Do also see our guide to our favourite B&B’s along the NC500, as well as our overall guide to NC500 accommodation. Your second day on the North Coast 500 will have you actually driving along Scotland’s northern coastline, and visiting the most northerly point in mainland Britain. First though, there are a few attractions in and around Wick that we recommend visiting. First of these is the fantastic Wick Heritage Museum. This is found in a warren of former houses near what was the herring harbour. Inside, you’ll find displays on all sorts of things relating to life in and around Wick. Naturally, there’s a strong focus on fishing, and the history of herring fishing in particular – Wick was once known as the herring capital of Europe! If you prefer to learn about a different traditionally Scottish craft, then you should drop in at the Old Pulteney Distillery. Founded in 1826, this was for a long time the oldest distillery on mainland Scotland. They produce an excellent single malt with a distinctive flavour that comes from the whisky being exposed to the salty air during the maturation process. Other highlights of the area include some castle ruins such as the ruins of Castle Sinclair Girnigoe, although you might want to be making tracks by now as you’ve still got a fair way to go. From Wick, you’re going to continue north on the A99 until you get to John O’Groats. From here you get lovely view of Orkney, a group of islands off the north coast of Scotland. You can also take a picture at the famous John O’Groats sign – famous because John O’Groats is the most northerly town on the UK mainland. If you wish, you can take a short detour from John O’Groats (around a five minute drive) up to Duncansby Head lighthouse. The view from the cliff top here is quite wonderful, and at the right time of year you might be lucky enough to spot whales. 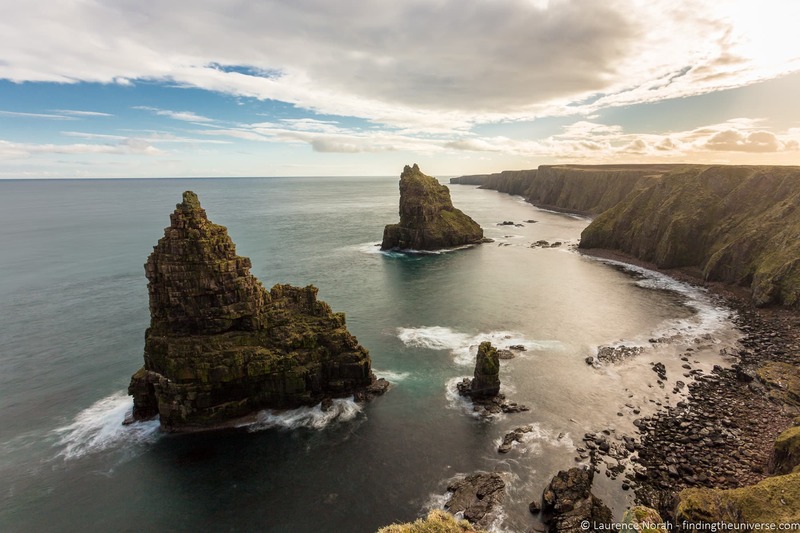 You can also take a ten minute walk across the field to the Duncansby sea stacks. Continuing west along the coast you will come to the next stop on our route for the day, the Castle of Mey. This was owned for a time by the Queen Mother. It’s possible to tour the castle, as well as the grounds, and there is a good cafe on site for tea, coffee and light snacks and meals. Further along the coast from the Castle of Mey you will come to the town of Dunnet. There’s a lovely beach here, as well as a fantastic gin distillery. If you a gin lover, it is very much worth stopping at the Dunnet Bay Distillery to take their tour and sample some of their gins (unless you are the driver of course!). 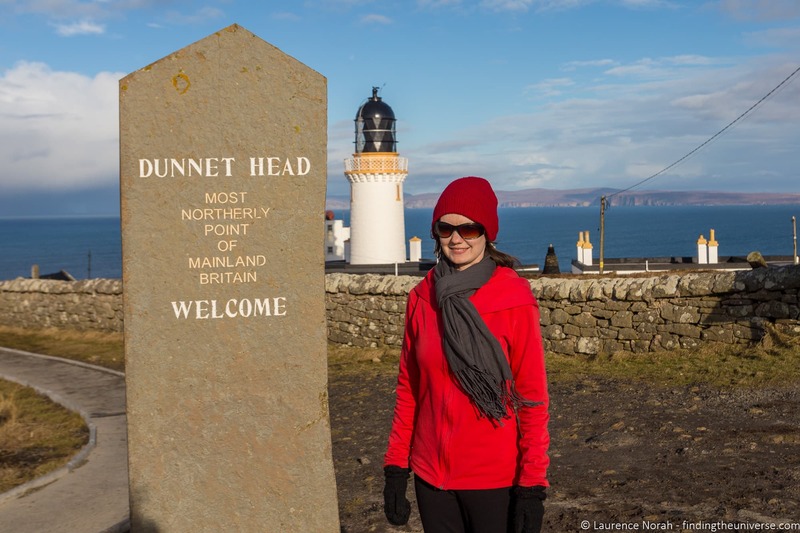 You can take a detour from Dunnet up to Dunnet Head. This is home to an RSPB wildlife reserve, and is also the most northerly point in mainland Britain. Enjoy the drive along the north coast, and do enjoy the dual lane roads while you have them, as you get further west you are going to find yourself on single track roads! If you’ve never drive on one lane roads, see my guide to driving on single track roads for some tips. The town of Bettyhill is worth a stop for the Strathnaver museum. This is a lovely little museum which tells the history of the Scottish highlands, including the clan systems and the tragic tale of the Highland clearances. There’s also a Pictish standing stone here. The next major village you’ll come to is Tongue, where there’s a small shop and a gas station, as well as various accommodation options. This is where we suggest you spend the night. The next town along is Durness if you would prefer to keep going, but we often struggle to find availability in Durness. In Tongue, if you want to do a nice 40 minute round trip hike with spectacular views, we can recommend the walk up to the ruins of Castle Varrich. It’s only a small two storey castle, but the views really are worth it. Day 2 Accommodation: In Tongue we recommend and have stayed at both the Tongue Hotel (also does good evening meals) and Tigh Nan Ubhal guesthouse in Tongue. We can also recommend the Ben Loyal hotel – we haven’t stayed here, but we had a lovely evening meal here once. The first stretch of driving from Tongue to Durness today is really pretty. It’s also winding and largely a single track road, so do take your time. 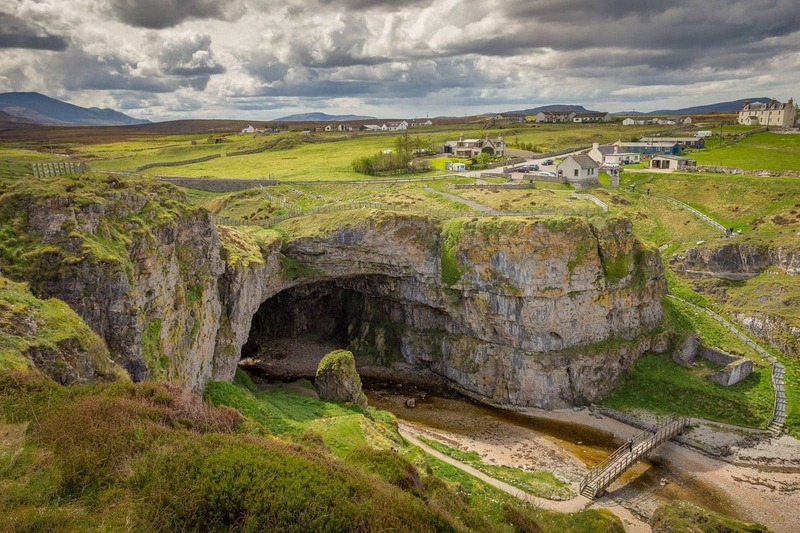 You’ll pass some incredible white sand beaches and lovely views before arriving into the town with our first attraction of the day – Smoo Cave. As the name suggests, Smoo Cave is a large cave which is a combination freshwater and seawater cave. It has a number of impressive features, most spectacular of which in our opinion is the waterfall inside the cave. Getting down to the cave is via a series of steps, and it will likely take you around ten minutes from the car park. You can explore the cave mouth area and visit the waterfall via a wooden walkway (be careful as it can be slippery). If you want to explore further, you can do so via a guided cave tour, with information on that available here. Other highlights in Durness include the lovely Sango Sands beach and, a short drive to the west, the Balnakeil Craft Village. This was an early warning station in the 1950s, built to detect and warn of nuclear attack during the height of the cold war. However, it was never actually used, and it was instead repurposed, becoming the craft village that you see today. This has been a long process, but today the village, which is now largely owned by the residents, is home to a number of lovely craft shops and cafes. 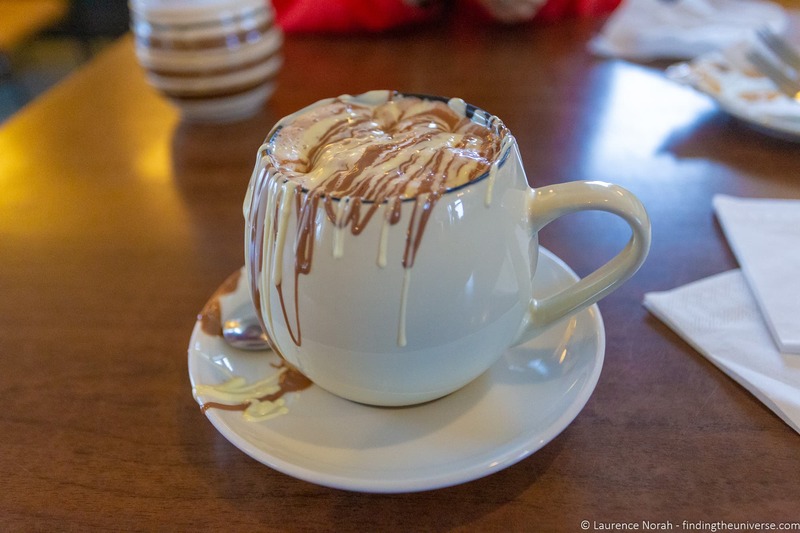 We can highly recommend a visit to Cocoa Mountain for a hot chocolate, but do also spend some time exploring the craft shops too, as you may find the perfect souvenir to take home from your trip. It’s time now to turn south, and drive down the west coast of the North Coast 500. As a landscape photographer, I will admit that the west stretch of the route down through the county of Sutherland is one my favourite photography locations on the North Coast 500. There are lovely views to be had on this stretch of the drive, with one of the more iconic North Coast 500 photos being Kylsesku bridge. There’s a parking area here just before the bridge with nice views of the surrounding landscape. A short way after the bridge, on the left hand side of the road as you drive south, is the Rock Stop Cafe and Exhibition Centre. This is an excellent place to come and learn about the geology of the area, which was in fact instrumental in shaping our understanding of geological processes in general. After the Rock Stop Cafe and a bit more driving you will come to where the A894 road meets the A837. If you turn right you can head down to Lochinver, home to an excellent pie shop and the Highland Stoneware centre, which is worth visiting if you are keen on pottery. The trip to Lochinver will be at least a 30 minute detour though, so keep that in mind. 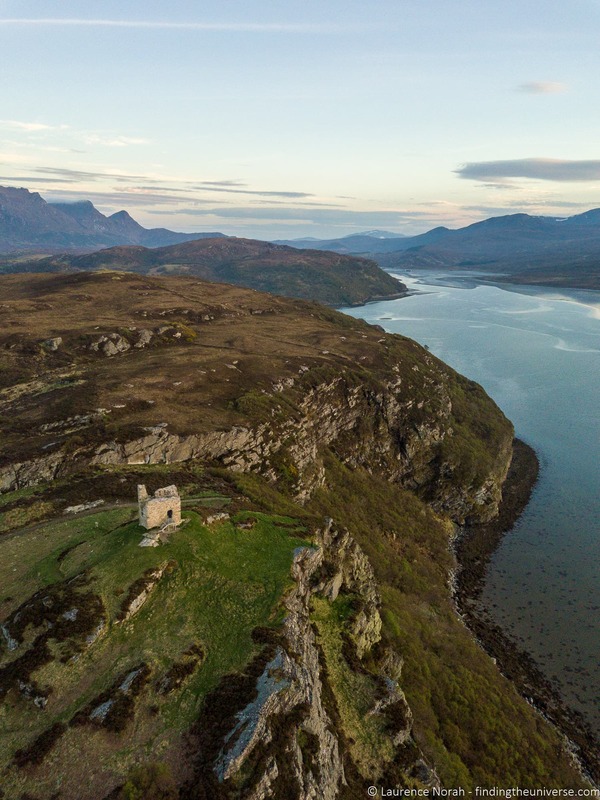 Otherwise, just after you turn left (east) onto the A837 you will come to the ruins of Ardvreck Castle and Calda House on the shores of Loch Assynt. Dating from the 16th century, these castle ruins are free to visit, and there’s parking on site, with information panels detailing what you are seeing. The castle was originally built by Clan MacLeod in 1590, although it was captured by Clan MacKenzie in 1672. They were responsible for constructing Calda House, a more formal manor house, in 1726, but this burnt down in 1737 and was never restored. But there is also a trail here that takes you up onto the ridge above the car park, where you can get even better views. Along the trail, there are a series of art installations and informational exhibits about what you are seeing and how it formed. You are nearly at the end of your third day on the North Coast 500, with your final destination of the day being Ullapool, which is the largest town you’ll be visiting on the west coast. This is a good place to refuel and get any additional supplies you might need. It also has the largest choice of hotels and B&Bs in the region, as well as some good restaurants to choose from. If you’d prefer to be a bit further out, and see some more spectacular beaches and scenery, we can recommend the half hour detour to the village of Achiltibuie. The drive out here is truly incredible. There’s also a hotel out here you can stay at, the Summer Isles Hotel. Day 3 Accommodation: Ullapool has a good range of accommodation options. Some places to consider are the Westlea B&B, the Royal Hotel Ullapool, Croft 17 B&B and the Ullapool Youth Hostel. We can also recommend the nearby Braemore Square and Broomview Cottage. From Ullapool you head south a short way on the A835 before turning right onto the A832 and heading out to the coast. 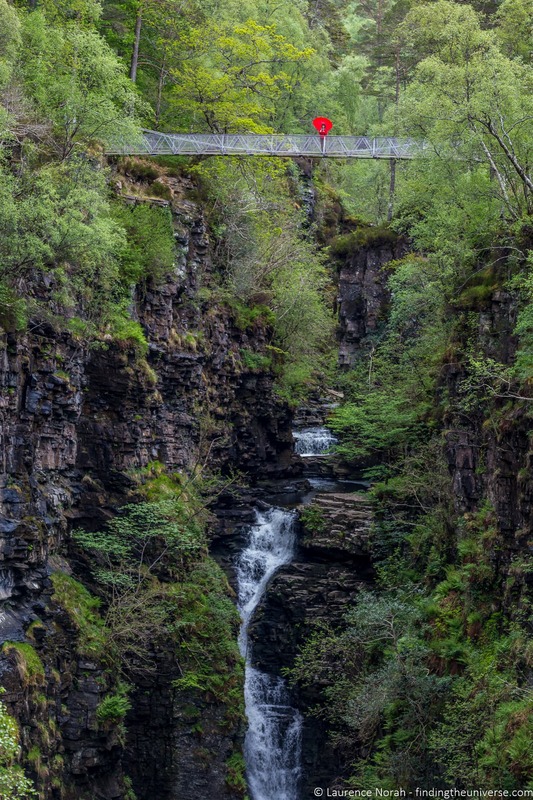 The first attraction you’ll come to is the Corrieshalloch Gorge National Nature Reserve. This is the home of a mile long box canyon, which you can see from a Victorian suspension bridge that crosses the gorge. This is reached via a short (if steep) walk, and there are also walking trails along both sides of the gorge. Continue from Corrieshalloch on the A832 out around the coast. If you want to visit a beautiful and fairly deserted white sand beach, a detour to Mellon Udrigle beach is a great option. Otherwise, head on round the peninsula until you get near to the village of Aultbea. If you like smoked foods, you’ll want to stop at the Isle of Ewe smokehouse, where a wide variety of home smoked products are available, including cold and hot smoked salmon. A great spot to pick up some picnic ingredients. Further on from Aultbea you will come to the Inverewe Garden and Estate. Managed by the National Trust for Scotland, this is lovely garden to explore which, thanks to a unique microclimate, is home to a wide variety of plant and animal species. Most impressive perhaps are the huge California redwoods, but you might also be lucky enough to see red squirrels, red deer, otters, seals, and golden eagles. 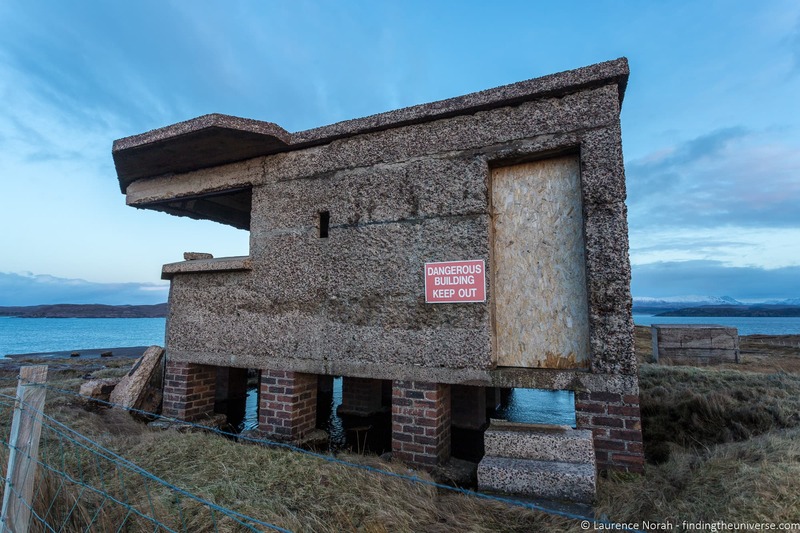 If you have an interest in WW2 relics, a detour up to the Cove Light Anti-Aircraft battery from Poolewe is a good option. This is around 20 minutes drive each way. The coastal battery was built in 1941 to provide anti-air defences to the coastline here. Whilst it was manned throughout the war, it never saw action. It was a fairly large installation though, and there’s still a lot left to see, although do take care as it is an old and unmaintained structure. The A832 now loops back inland, and you will start to drive along the shore of lovely Loch Maree. This offers some lovely photo opportunities, especially as the loch has Siloch mountain providing an impressive backdrop. There’s also a short walk to a waterfall here called Victoria falls. It’s a short walk to the viewing platform to see the falls, which are pretty, if not quite as impressive as their African counterpart! 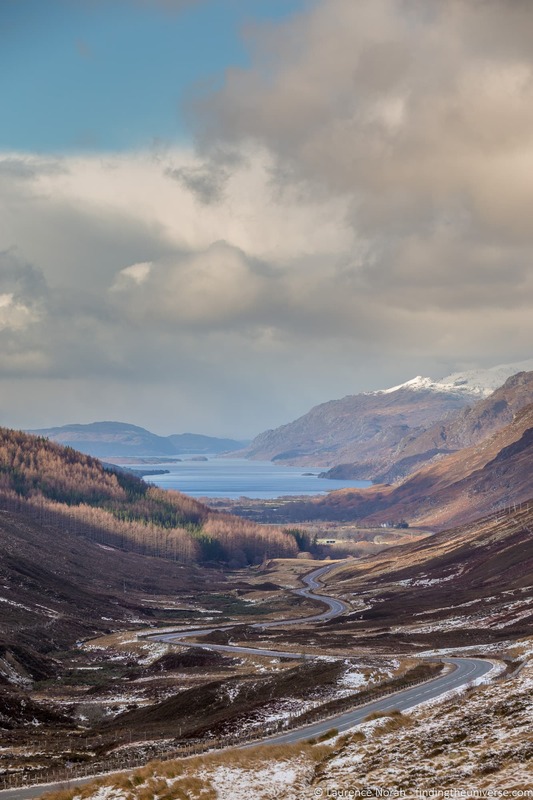 After loch Maree you will get to the village of Kinlochewe, where you’ll turn on the A896. This is another stunning stretch of road that winds between mountains and lochs, and offers numerous excellent photography opportunities. Just be considerate of other drivers and only stop in parking areas, not passing places. Finally, you arrive in Torridon, where we suggest you spend the night. You can also carry on to Locharron or Applecross, where there are further lodging options. Day 4 Accommodation: In Torridon if you want to spoil yourself we can highly recommend The Torridon, which is one of the few 5* hotels on the North Coast 500. We had a lovely nights stay, evening meal, and afternoon tea here. They also operate the next door Torridon Inn, a high end B&B style option. Other nearby options to consider include the Torridon Youth Hostel, the Pathend B&B in Lochcarron or the Kinlochewe Hotel in Kinlochewe. Today you’ll be finishing the North Coast 500 and returning to Inverness. Of course, if you have more time and want to continue exploring, you could also head to the Isle of Skye at this point. If that sounds good, see our tips for visiting the Isle of Skye to help you plan. 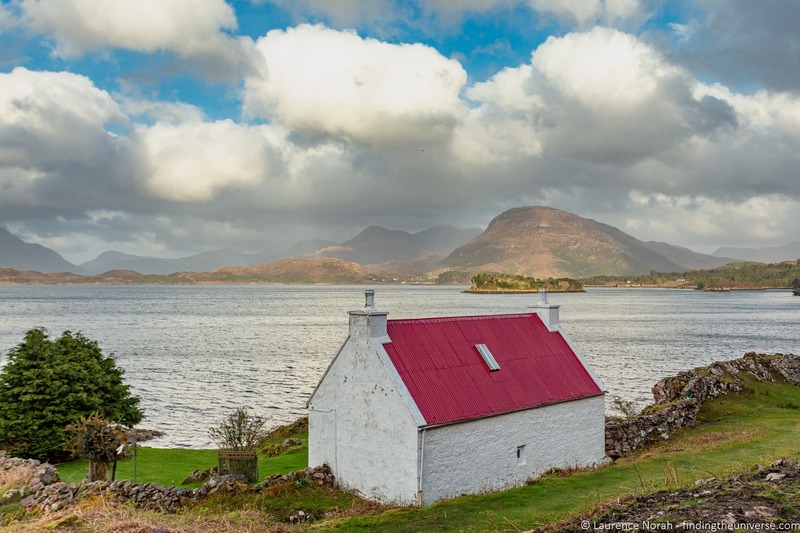 Assuming you stayed in Torridon, the first thing we recommend you do is drive around the Applecross peninsula. This will take you on some seriously winding roads which will also offer you views across to the Isle of Skye. 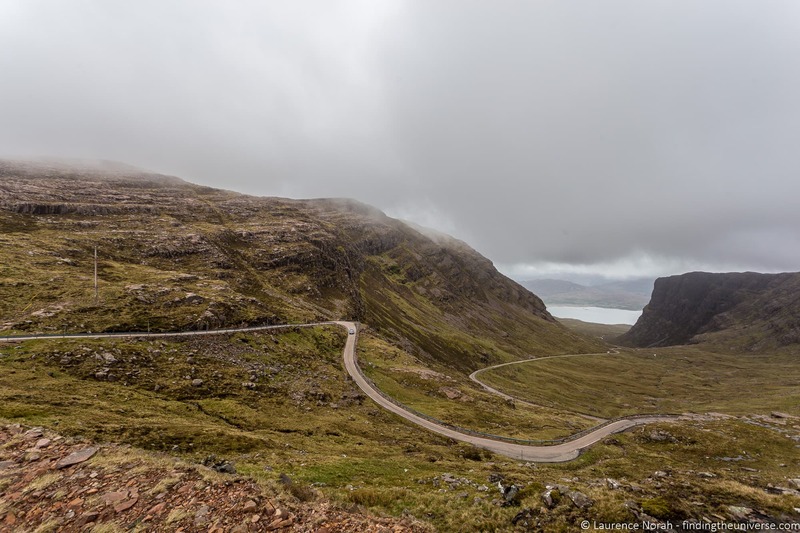 The road is also well known as being home to the Bealach Na Ba, an alpine style road which is one of the highest roads in the UK. The view from the top of the pass is legendary – as are the curves and gradient on the way down! Just take your time and enjoy the views. Note that this road is generally considered unsuitable for larger motorhomes and if you are towing a caravan. It can also close due to poor weather, especially in winter. So instead, you would want to take the A896 that goes between Sheildaig in the north and Ardarroch in the south, and thus skips the Applecross peninsula. From the bottom of the Bealach Na Ba you will pass through the village of Locharron. If you want to see deer, a tour with Colin Murdoch of Reraig Forest is a must. Colin is a deer stalker who manages a herd of these beautiful animals, and you’ll get about as close as is possible. The tour lasts around 90 minutes, and is well worth it. Just make sure to book well in advance if this is of interest. Also near Locharron is the ruined Strome Castle, and Locharron Weavers. If you are interested in learning about how tartan is made, or want to pick up some tartan of your own, Locharron Weavers is the place to come! From Locharron you will head back up to Achnasheen. You could take a detour to the left here to visit the Glen Docherty viewpoint, which is another great photo opportunity. Otherwise, continue east on the A832 back towards Inverness. If you have time on your way back, you could also stop at Rogie Falls. If you visit at the right time of year, this is a good spot to see salmon leaping as they journey up to their spawning grounds. Otherwise, it’s a lovely place to enjoy the waterfalls. 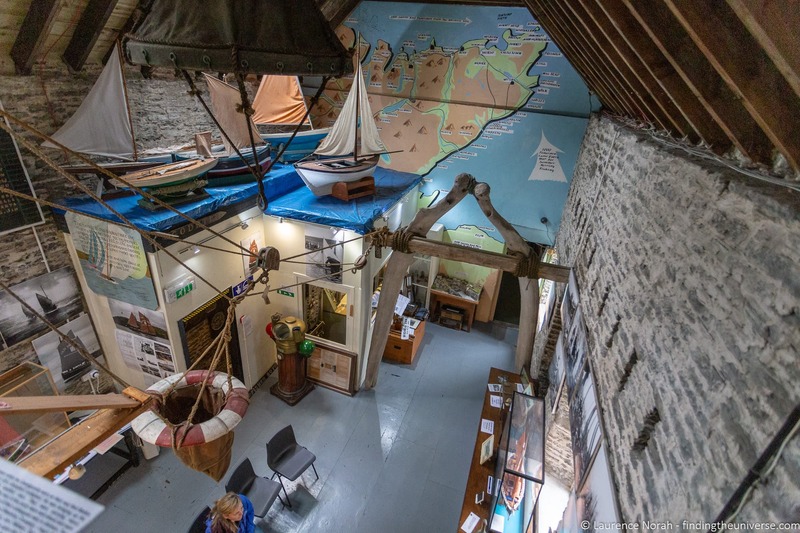 Another stop as you near Inverness is the Dingwall Museum, which has a lot of information and displays about the local area. Finally, you’ll find yourself back in Inverness, where your North Coast 500 road trip adventure comes to an end! We hope you had a wonderful trip. Day 5 Accommodation: If you are staying the night, there are lots of options in Inverness. We’ve stayed at and can recommend the Bunchrew House Hotel, Kingmills Hotel and No. 55 B&B. For a hostel, consider the well rated Bazpackers. 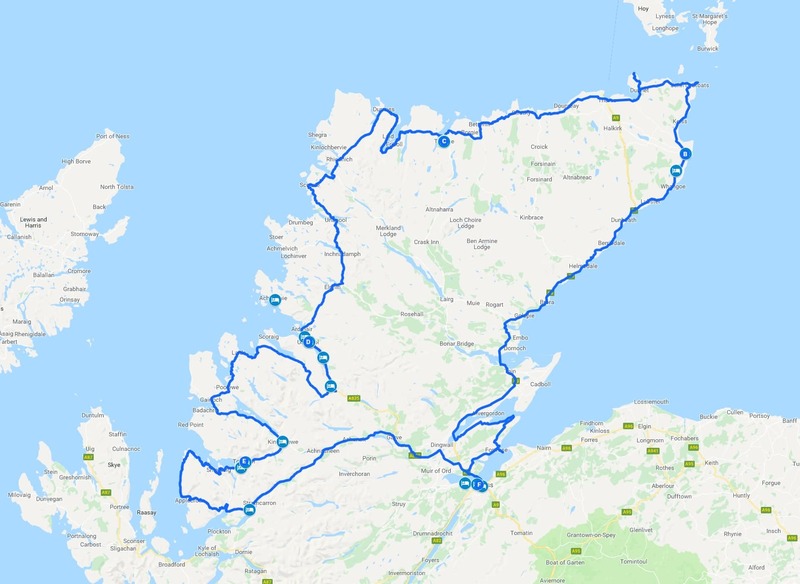 To help with your route planning we’ve put together a map of this 5 day North Coast 500 itinerary. You can also see this on Google Maps here. We have written a detailed planning guide for the North Coast 500, which we recommend reading as it contains a great deal of useful information. However, we also wanted to include some essential tips in this post to help you plan your trip. The North Coast 500 has become very popular in the last few years, even being labelled Scotland’s Route 66. Whilst this is great news for the local economies in this otherwise fairly remote part of the UK, it has also meant that it can be tricky to find accommodation. This is particularly the case if travelling during the busier months from May through to September. As such, we highly advise booking your accommodation in advance if you are travelling in the busier months. There are not a huge number of options, especially in the more remote sections of the route, and just turning up in a town without reservations might result in you having to drive significant distances to find the next available room. The North Coast 500 is in one of the most remote and beautiful parts of the UK, which has a low population density. As such, cell coverage can be spotty. The majority of hotels and guesthouses we’ve stayed in have had WiFi, but don’t expect this to be super fast. It will likely be fine for social media and checking e-mails, but might not suit streaming video or downloading large files. In addition, some of the older properties on the route, especially the castle hotels, have very thick walls. As such, WiFi might not be available everywhere. The North Coast 500 has a variety of road types, which vary between normal two lane roads, and single track roads. The roads are, for the most part, in pretty good condition, although some stretches will have pot holes. If you’ve never driven on single track roads before, we urge you to read our guide to driving on single track roads. This will explain how to properly use passing places, single track road etiquette (who goes first? ), and other useful tips. Please only use the passing places for passing – don’t pull off onto the verges of the road as this causes long term erosion and damage. They are also not for parking in – only use designated parking areas for stopping. If you are driving in winter, do be aware that conditions can become icy, and the roads can become snow covered. There are gritters, but this is a long stretch of remote road. When we drive the route in winter, we carry snow chains for our car just in case. We’ve not had to use them as yet, but we think it’s better to be safe than sorry! You will notice a theme about these tips, as they largely revolve around the remoteness of this area! There are not huge numbers of restaurants along the route, so you will definitely want to plan where you are going to be eating that day, especially for dinner. Many of the hotels along the route do offer evening meals and breakfasts, and some of the towns also have restaurants. However, do please check opening times, as many restaurants are not open year round. Reservations are often a good idea in the busier months. If you are staying in a smaller guesthouse or B&B, it is likely that they will not offer an evening meal. If this is the case, make sure you eat before you arrive, or have a plan for a nearby location for a meal, as some spots can be fairly remote. You don’t want to arrive somewhere hungry and realise you have to drive another 40 minutes to find some food! The rise in popularity of the North Coast 500 has not been without its issues, as the increase in the visitor numbers has put pressure on the local infrastructure. This includes things like public toilets and waste disposal, as well as the roads. This is a wonderful part of the world and we’d love for it to stay that way. If everyone does their bit, including things like being careful with litter, disposing of chemical toilets at official disposal points and driving carefully, it will hopefully remain wonderful for many generations to come. Hopefully this post has given you lots of ideas for planning your own 5 day North Coast 500 itinerary. As mentioned, we’ve driven the route many times, in all seasons and weathers. We’ve put together a number of articles to help you plan your own adventure. We also have some third party resources to recommend. For accommodation, we have a guide to where to stay on the North Coast 500, which covers everything from luxury castle hotels to smaller guesthouses. We also have a list of our favourite B&Bs on the North Coast 500. 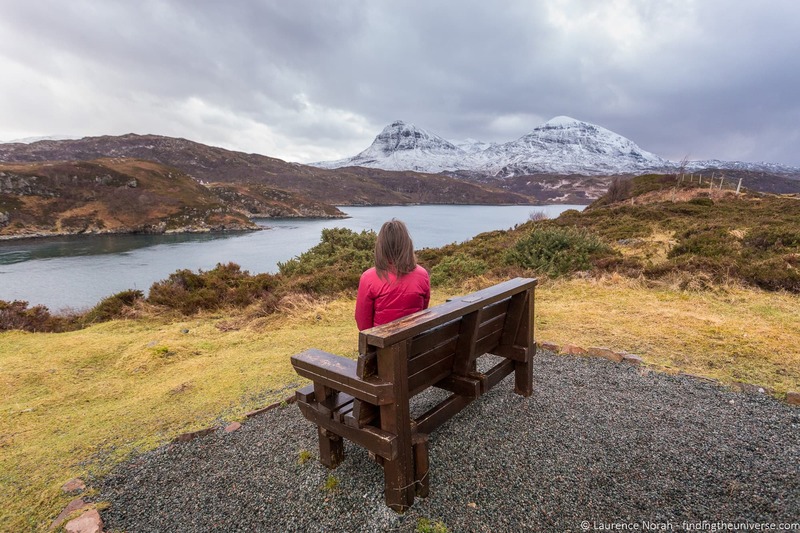 I’ve put together some of my favourite photography spots on the NC500, as well as some of our highlights of the NC500, to help make sure you see everything you want to see. This being a driving route, we also have some tips in the area. We have a guide to single track roads, as well tips for driving in the UK in general. If you want to extend the route, you could do so from Inverness with the North East 250 driving route – see our 3 day NE250 itinerary for ideas. You could also visit the Isle of Skye. Alternatively, why not base yourself in Inverness and do some day trips from Inverness? And that’s it! We hope you’ve found this guide useful, and are now feeling ready to tackle the North Coast 500! As always, if you have any questions or feedback about this post, do let us know in the comments below. Happy driving! 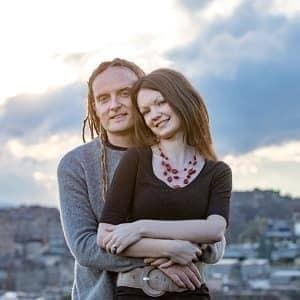 Hi Laurence and Jessica, I’m a Scot who has been wanting to do the North Coast 500 for a years. My partner and myself are hoping to drive it this summer and camp. I’m so glad I’ve found your site,think we will be following your route. I’m so excited to get started. I’ve also read your post on the Devils Pulpit, another place on my bucket list. Thanks so much for the beautiful pictures and narrative. We hope this is the year you get to do it, it’s one of our favourite parts of the world. We’re actually setting of in a few days to do it again, and also to visit Orkney, Lewis & Harris as well 🙂 Can’t wait! When you mentioned perfect in your title, I got a little skeptical. But as soon as I read the article and marveled at how beautiful the photos you took are, I was stunned. Definitely my idea of a perfect Scottish road trip too! Thanks, Laurence and Jessica!